It's been a few months, I know. But I assure you I have been busy crocheting away! I've actually been working on two blankets. If you are signed up to Missed Stitches on Facebook, you will see a photo of one of them! 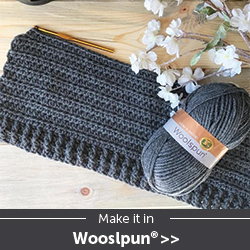 Both are being worked in the shell stitch, an easy and beautiful cluster stitch. I don't have a name for this blanket but I do have instructions on how I made mine! I apologize for the color disparity, lighting varies in my apartment. This blanket measures 44" x 60" finished. I used Caron Simply Soft yarn in 6oz sizes. The shell stitch is a multiple of 6 cluster stitch for the way it works up. So if you want your blanket wider, count off 6 chains at a time then add 1 on the end. 1) sc in 1st ch, sk 2 ch, 5 dc in next ch, sk 2 ch, sc in next ch, *sk 2 ch, 5 dc in next ch, sk 2 ch, sc in next ch. Repeat from * across to end of row. 3) ch 1, sc in 1st st, sk 2 dc, 5 dc in next sc, sk 2 dc, sc in next dc, *sk 2 dc, 5 dc in next sc, sk 2 dc, sc in next dc. Repeat from * to the end of row. For the border, I did 2 rows of sc, then I did a (dc, ch 1, sk sc) across for three rows. Then another 2 rows of sc, followed by one row of dc to finish. I only applied this border to the ends, not the sides. 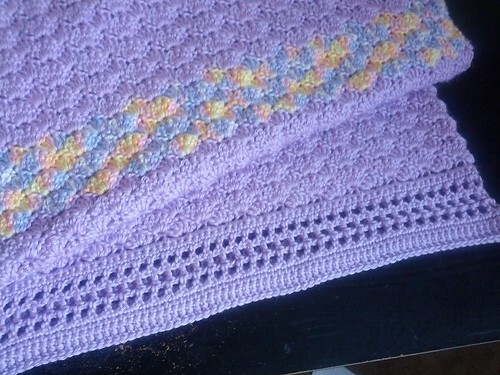 Your crochet shell stitch blanket is lovely, Your instructions seem nice and clear and easy to follow. I'm going to print this off and buy some pretty lavender yarn and get started when I finish my current project. THANK YOU so very much for gifting us this lovely blanket pattern along with your beautiful pictures and clear instructions. I just found your sight and plan to spend some serious time reading through it. This is beautiful. How about calling it Lavender Beauty? I'm completely new to crocheting, but I don't want to make things I don't want or need. 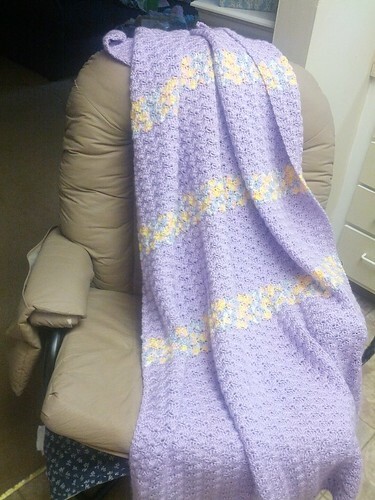 I had a friend once who made the most beautiful blanket using the shell pattern so I want to make one too and hope it's half as nice as her's was. You talk about the border as if you added it on later rather than doing it first before you did the body of the project. I'm going to have to google what the asterisk is for. 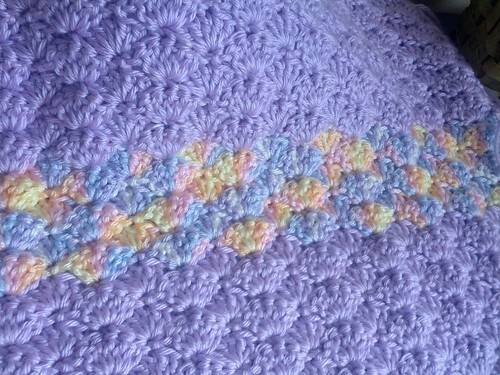 I linked to this pattern from a photo of a cream/beige blanket that is similar but different. Are they the same pattern with minor variations, or are they completely different? If it's the same with variations, can you summarize the differences here? If they're different patterns, is the other available? This one is beautiful but too "girly" for the person I have in mind. Both your patterns and color selections are gorgeous. Thank you so much for sharing! 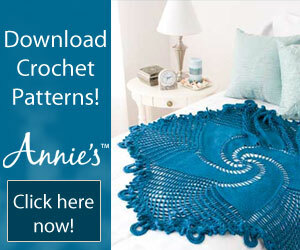 If you're referring to the picture at the bottom of the Free Patterns page, then yes it is exactly the same. Could you please tell me what to do at the end of row 3 before going to row 4? Please forgive my late reply. For this pattern, when you finish row 3, you're gonna do row 2 again for row 4 and so on. So ch 3 and turn then follow with 2 dc.